The first appearance of Super-Patriot and the Buckies, a group of beer-drinking America firsters who beat up college students and immigrants. He and Cap eventually fight, and literally wear each other out. 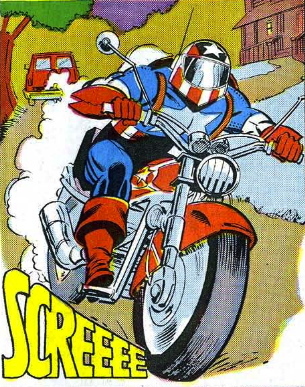 Cap is so tired, he doesn’t even chase Super-Patriot when he runs away. At the end of the issue, it’s a preview for an upcoming story: Late at night in Washington an IRS auditor connects Steve Rogers to the Super Soldier experiments, figuring out his secret.